Manchester United took a giant stride towards the Champions League semi-finals with a clinical victory against AS Roma at the Stadio Olimpico. Cristiano Ronaldo headed home his 36th goal of the season from Paul Scholes' cross six minutes before half-time. Roma rallied, with Christian Panucci missing from close range and Edwin van der Sar saving brilliantly from Mirko Vucinic's 61st-minute header. But Rooney bundled home United's crucial second five minutes later. The result leaves United clear favourites to reach a likely semi-final showdown against Barcelona. Sir Alex Ferguson made three changes from the side that won so emphatically against Aston Villa on Saturday - Van der Sar, Anderson and Ji-Sung Park replacing Tomasz Kuszczak, Ryan Giggs and Carlos Tevez. Vucinic led the Roma attack in place of injured captain Francesco Totti, and he was a lively figure in a first 45 minutes that saw United relatively untroubled. Panucci posed an early threat when he rose to meet David Pizarro's corner but headed over the top. Vucinic was just off target before United suffered a blow after 29 minutes when Nemanja Vidic was carried off after landing awkwardly on his knee in an aerial challenge. However, United reacted well to the setback and took the lead with a priceless away goal from Ronaldo six minutes before the interval. 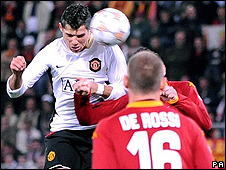 Scholes sat up an inviting cross and Ronaldo rose superbly to power a downward header past Doni. The Portuguese winger took a heavy bang to the head in scoring, but recovered quickly to carry on. Vucinic could have levelled two minutes later, but he jabbed a finish across the face of goal after escaping the attentions of the United defence. Roma set about United with intent after the break, Max Tonetto sending a powerful drive just wide and Panucci wasting their best chance of the night when he blasted over from close range after United failed to deal with Vucinic's long throw. It prompted a response from Ferguson after 55 minutes as Owen Hargreaves was sent on for the disappointing Anderson, who was also suffering a hamstring problem. Roma were testing United's resolve, and just after the hour Van der Sar needed to produce a stunning reflex save to turn away Vucinic's flicked header. But United survived the siege to break out and deliver a stunning counter-punch to double their advantage. Park did well to head Wes Brown's long cross into the danger area and when Doni failed to collect, Rooney bundled home from inside the six-yard box. Roma, understandably, looked demoralised and United came within inches of adding a third and effectively putting the tie to bed late on. First Ronaldo fired a low shot against an upright before Michael Carrick was just inches off-target from 20 yards as United gathered momentum. Then, with seconds remaining, Ronaldo almost crowned the perfect in night in spectacular fashion when he volleyed just over from substitute Tevez's cross. Roma: Doni, Cassetti, Mexes, Panucci, Tonetto (Cicinho 69), De Rossi, Aquilani (Esposito 76), Taddei (Giuly 59), Pizarro, Mancini, Vucinic. Subs Not Used: Curci, Antunes, Ferrari, Brighi. Man Utd: Van der Sar, Brown, Ferdinand, Vidic (O'Shea 34), Evra, Carrick, Scholes, Anderson (Hargreaves 55), Ronaldo, Park, Rooney (Tevez 84). Subs Not Used: Kuszczak, Giggs, Pique, Silvestre. Goals: Ronaldo 39, Rooney 66. Ref: Frank De Bleeckere (Belgium). BBC Sport Player Rater man of the match: Manchester United's Cristiano Ronaldo 8.31 (on 90 minutes). • Please note that you can still give the players marks out of 10 on BBC Sport's Player Rater after the match has finished.